With automatic duplex capabilities and print speeds of 22 pages per minute (ppm), the HP Color LaserJet 4650hdn printer offers speed and convenience that any business will appreciate. 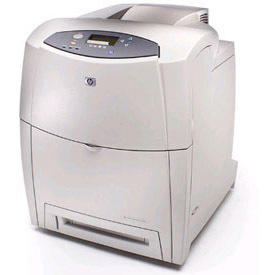 This device is perfect for a larger midsize office that requires fast printing to keep up with the pace of your staff. You’ll be able to crank out high volumes of work for any project, and thanks to the relatively high page yield of HP 641A toner cartridges, this printer won’t have any trouble staying on top of your workload. You know that original equipment manufacturer (OEM) toner produces great work, but you may also know that OEM products can be very expensive. Thankfully, you can get OEM print quality at a fraction of the cost with remanufactured toner from 1ink.com. Our remanufactured HP toner will give you the same incredible color prints, the same flawlessly legible text documents, and the same print specs as an OEM product. Each cartridge was designed for easy installation in your printer and is guaranteed to produce flawless work that will meet your needs and stay within your budget.